It's almost unfair to this sequel to be tied to Seraphina. It's predecessor was such a perfect book, an all-time favorite, that Shadow Scale is bound to suffer in comparison. Indeed, it's a complicated book to review. The first third or so is a bit of drudgery, a slow moving and somewhat aimless plot. I felt bored and quite nervous; I'd wanted to love this book. Thank god, I stuck with it. The brilliance of Shadow Scale hit me (to borrow a phrase from John Green) slowly, and then all at once. The stakes raise, the plot picks up, and suddenly I was unable to put it down. Seraphina becomes locked in a battle against time. She must find the other half-dragons in time to stop a devastating, international, interspecies war. She's thwarted at every turn by a devious enemy, even by her own allies. How do you fight a war when even your mind isn't safe? Life-changing secrets are revealed; cultures are explored; dragons are taught how to behave properly. It all culminates in a shocking clash of warriors and wills that could save Gorredd, or destroy it. While the ending is somewhat idyllic (and raises some questions about feasibility), it's a satisfying conclusion to the duology. And if anyone could make it work, it's Seraphina. Shadow Scale rewards the patient. Honestly, this book would be nearly as good as Seraphina (because who can surpass it?) if not for the first third. It begins fortuitously enough. Seraphina and her ityasaari friends realize that their minds are uniquely capable of forming a magical trap, the kind that can rip dragons from the sky. Just in time, because the dragon cabal that wreaked havoc in Seraphina is threatening war. So Seraphina goes looking for her kind. And then there's a lot of traveling and I was bored and sad. But wait! Everything changes with the return of an unexpected character. Now there's traveling with tension. It's a race to find the ityasaari before the villain does. There are coups, deadly battles, allies turned against each other. With her allies falling one by one, it comes down to Seraphina and her few remaining friends to infiltrate the dragons, resist the powerful villain, and reach Gorredd in time to stop an enemy who knows them better than themselves. The rest of the book is so exciting, full of shocking revelations and maddening twists, that it well makes up for the sludgy beginning. I gushed about worldbuilding in Seraphina. Shadow Scale is further proof of Hartman's mastery. Here, we actually encounter Ninys, Samsam, and Porphyry as Seraphina journeys through them. The cultures are a little derivative--Ninys as a sort of Spain/Italy, Samsam as Scotland, Porphyry as Phoenicia--but they're given enough original twists that they seem like inspired other-world variations rather than copies. Attention is paid to their religions, social morays, even food. Hartman should write a travel guide. In addition, the whole plot with the ityasaari and the Porphyrian dragon exiles is so incredibly cool. Everything you thought you knew about dragons, about Seraphina, about the grotesques, will be upended and amplified. Get ready to be wowed. Of how many books can you say that you love every single character? The characters kept me going even when the plot lagged. Seraphina is still incredible, and grows even more here. The stress wears on her; she's uncharitable sometimes, impetuous, cold. But she keeps strong when no one else can. I admire her deeply. Glisselda has come into her own as acting queen, proving that one can be clever, badass, and kind of giggly. Kiggs is still adorably sharp and self-sacrificing. Comonot is delightfully obtuse. Now enter the parade of amazing newish people! Remember Abdo, the mute boy? He becomes a force of nature in this book, snarky and funny and heartbreakingly loyal. Newcomers Camba, Blanche, Nedouard, Ingar, and Brisi each have their own huge personalities. It's like being introduced to new family; by the time you finish the book, you feel like you know them all. One of my favorites was Jannoula. She's frustratingly multifaceted, hatable and pitiable, and she's one of the best-written characters in the series. How does Hartman do it? I'd love to know. Her style remains beautifully old-world, the musings of a masterful storyteller. Much of her writing is truly beautiful. Her descriptions stick with you, although I would have liked a little more scene-setting in each of the different countries. Moreover, I think she's gotten funnier since Seraphina. And she was already funny. But there were dry, witty moments in Shadow Scale that I re-read several times because they were so hysterical. It's truly a masterful example of craft. Although I still don't really get the title. The Ardmagar inserted himself between us and took my arm. "I joked--did you notice? I said I didn't know, when in fact I did, and then I pretended to wonder--"
"Indeed, Ardmagar. Well done," I said. 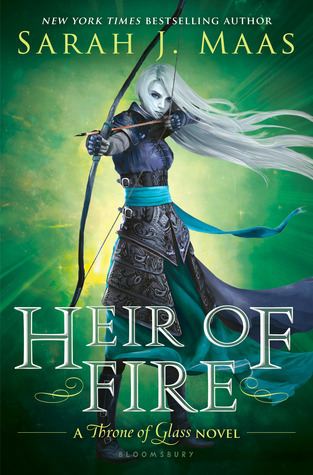 You wouldn't expect a high fantasy to be one of the best examples of gender and sexual diversity in young adult fiction. Perhaps that's sad. Shadow Scale is resounding proof that LGBTQ issues need not be confined to "issues" books. (Disclaimer: Issues books are important too! I'm just super excited when I see diverse characters in books of various genres, because it means that LGBTQ characters are being represented because they're people in the world, and it's not some huge deal to have a gay character, because they're a character too!) First of all, you have at least two main characters who are gay, and no one makes a huge deal about it. Love is love. Second, you have Porphyry, where "How may I pronoun you?" is the first thing a polite person asks a stranger. Gender fluidity is built into their system. And one of my favorite characters in this book is a trans woman. Hartman takes time to discuss her gender identity, but, unlike a poor writer, doesn't make it the defining characteristic of the character. Her gender identity is seen as a part of her, while all the other parts are allowed to shine too. Rock on, Rachel Hartman. Rock on. 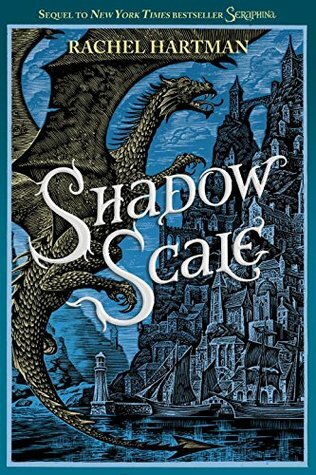 Stick with it through the slow beginning, and Shadow Scale will reward you with a beautifully-written tale full of humor, adventure, friendship, and surprises. It's a fairy tale for the modern world. Stick with it through the slow parts and you will. It has all the charm and wonder of the first book. I can't imagine anyone who loved book one not enjoying it.